Fast forward several decades. Title IX opened up a vast array of opportunities for girls. But while both boys’ and girls’ sports require me to sling hot dogs at the concession stand, write checks so large they make me tear up, and hit the grandparents up with all sorts of fundraising campaigns, there is one key difference. My daughter is on the dance team. And for the dance team, I have to rhinestone a costume. Make no mistake; the dance team girls are athletes. If you don’t believe me, try kicking your leg over your head for the next three hours and then tell me whether you didn’t pull a hamstring, a groin muscle, and everything in between. But I have never been asked to rhinestone a baseball jersey or apply sequins to lacrosse pads. I do not have to alter ski gear. And while my boys have occasionally required the use of kinesio tape, neither has ever required the use of Hollywood Fashion Tape® before entering the field. In short, boys’ sports do not require me to use any crafting skills whatsoever. This inequity makes me uneasy, but frankly, it’s probably not because it throws us back to the days of girls vs. boys as much as it is an aversion to rhinestoning. Let’s just say it is not a core competence. But as sports parents know, when your kid signs up, you sign up. This is my daughter’s first year on the team, and I certainly will be required to rhinestone again. The coach has decided that the girls’ time is too valuable to devote to modifying their costumes. My time, however, carries no such premium. Just call me the Rhinestone Cowgirl. 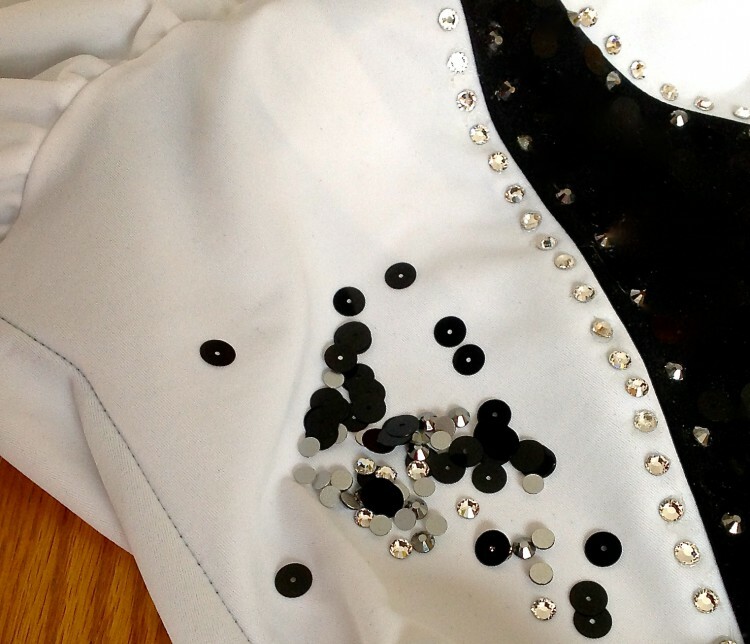 This entry was posted in Parenting, Surly Teen and tagged costumes, dance team, how to rhinestone, humor, kids' sports, rhinestoning costumes, sports parents, Title IX by Sarah Day. Bookmark the permalink. Need I remind you of the incredibly intricate dress you hand sewed for the Senior dance at Marquette? You spent countless hours stitching and re-stitching that gorgeous gown. Your skills are not lost, they have just been lying dormant for a while. The dance team is lucky to have you. Wait until they find out this hidden talent of yours?? Whew, there’s some brain cells I haven’t tapped in a while. Actually, what I remember most vividly about that dress is sitting on the floor in it, next to the band, bathed in sentimental tears. Geez.